As of November 2017, Yahoo no longer supports automated price retrieval. Use Prices, Update Prices from Screen to step through price updates manually. This is only viable if you have a few holdings. Use Prices, Update Prices from File to read in a comma-delimited file of prices you create. This is a little easier than prior option. The best approach is to use Yahoo finance by creating a portfolio then exporting the prices. This takes a little setup work, but then only requires one extra step other than maintaining the portfolio of symbols. This approach is detailed below. Go to finance.yahoo.com. If you have a Yahoo account, login. Otherwise, create an account. Select My Portfolio from menu bar. Create a new portfolio with all of the symbols you want to retrieve. To see which symbols you are getting now, go to Capital Gainz, select Prices, Get Prices From Internet, then choose the Global Sec button. As you change your holdings, you will need to update the Yahoo portfolio. In Capital Gainz, choose Prices, Update Prices from File. Click the Format button, and erase all fields except for Field #1 SYMBOL and Field #2 Price. Save your format by clicking OK.
At finance.yahoo.com, login if necessary and go to My Portfolio, then select the portfolio you want. Click Export button at the top of the portfolio listing. Note where you are saving the .csv file and click Save to download price file. Make sure Date to Use If Not Found is set to date you got prices for. Select the file you saved from Yahoo, and click Ok.
As before, you can use View button to see the prices read in, then use Ok to apply them. Yahoo does download dates for prices. However, the format used is not recognized by Capital Gainz. Thus, just remove that field from import as discussed. If something here is not clear, let me know and I will try to explain better. I've been using this method for a while now, and actually really like it. The Yahoo finance portfolio displays delayed intraday prices and updates them continuously, so it's nice to have that up and running in the browser. Anyone with ideas for alternative sources, let me know. Surprisingly, there's nothing out there like what Yahoo provided via single URL. The services I'm looking at only provide a price (or prices) for a single security in a single call. That means if you have 100 stocks, there would be 100 internet requests - which is slow (or very slow, depending on your connection) and probably results in some number of errors each time. So, the Yahoo finance portfolio workaround I describe is likely much faster, though it does require an extra step for the user. Yahoo should set up some kind of keyed service where they charge a nominal amount, as a lot of people and products used their price service. I know they could use the money to pay their lawyers working on their data breach cases. I'm looking at creating a new price retrieval module, but after a few days of research the outlook is grim. Capital Gainz Config/System Configuration settings/changes are not staying set, the cause is unknown. However, you can simply edit CG.INI directly with Notepad (NOT Word) to make changes. 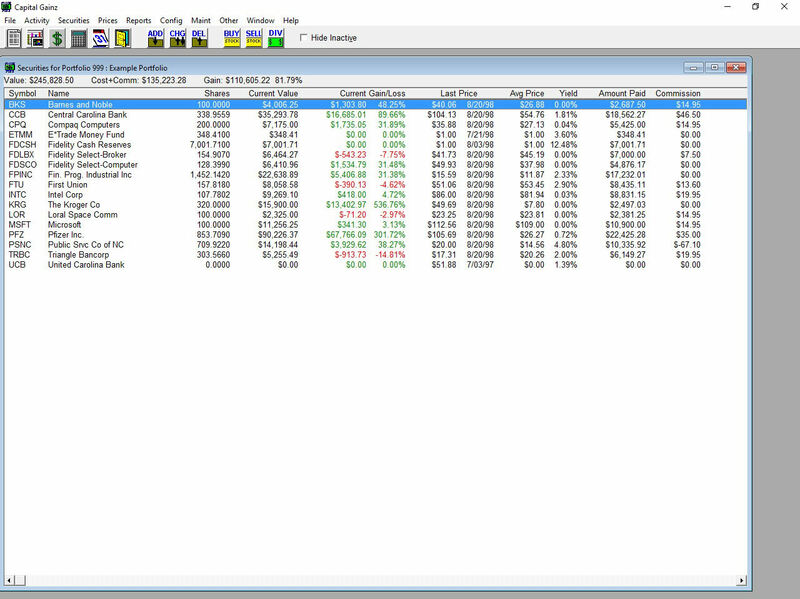 Capital Gainz price and total return graphics no longer appear to work under the latest Windows 7 release. There is no known workaround at this time, as even compatibility mode does not work. As of March 2003, work on Capital Gainz has been suspended. We will continue to sell and support the latest version, 6.0, but at this time it appears unlikely that there will be any future updates. Contact us via the email address only. Support/ordering via the previous phone, fax, and P.O. Box are no longer supported. Capital Gainz is now download-only. It is no longer distributed on physical media, such as diskette. If you copy or restore data files to a PC and then get an error indicating "Access Denied" on a .DAT file, then it is likely that the data files were inadvertently made "Read-Only". This can occur on copies from CDROM. To fix this, in Windows Explorer, highlight all the files in your Capital Gainz directory (and data directory, if you keep data elsewhere) by clicking on a file in the directory and choosing Select All from the Edit menu, right click on the selected files and choose Properties, clear the Read-Only checkbox, and then click on the Ok button. TurboTax 2000 has problems importing a TXF file created by Capital Gainz. However, you can get around this by editing the TXF file, changing the first line from V030 to V037. Be sure to use a text editor, such as Windows Notepad, and not a word processor, such as Microsoft Word. Information on how to handle options in Capital Gainz. There appears to be a bug in latest MS Internet library, which is ignoring Capital Gainz' requests to not cache data. If you are having problems where prices displayed in Capital Gainz are not being updated when you use Get Prices from Internet, then a workaround is to change settings in Internet Explorer. In IE5: Tools, Internet Options, Settings button, Check for newer versions of stored pages=Every visit to the page. Capital Gainz costs $69 for new users, $25 for registered users. It is available as a download only, no disk/CD shipments. You can order via Paypal From Here. On registration, you will receive a username/usercode which is required in order to upgrade data from any prior version of Capital Gainz. Any usercode for versions prior to 6.0 will not work with this version. If you do not have a valid username/usercode, you can only install the Evaluation version. Click here if you are still having problems with Capital Gainz's windows shrinking/growing on program exit/reentry. If you get the error "Could not create graph (VtChartLib.VtChart)" when trying to create a graph with Capital Gainz 6.0, click here for the solution. Click here for instructions on copying a portfolio across computers. Yahoo! recently changed some things for quote retrieval. Click here for fixes and workarounds to price retrieval problems. When copying data from CDROM, data files are sometimes left in read-only state. Click here to see how to fix 'Data files open in another program' and 'Access Denied' errors. Capital Gainz is an investment portfolio manager that balances the modest needs of the small investor with the complex requirements of the professional investment manager. It's ideal for investors following a 'dollar cost averaging' strategy with mutual funds or dividend reinvestment plans. You record purchases, sales, and distributions with easy to understand forms, and select records from scrolling tables. To record a sale, simply specify how many shares to sell and the selling method: FIFO, LIFO, max gain, max loss, specific ID, average cost. The shares selected are displayed for confirmation or for a 'what if' scenario. You can calculate and compare a security's total return with your actual realized performance, which uses purchases, sales, and distributions to calculate the internal rate of return. You can reinvest dividends, record splits and conversions, and enter bond discount/amortization. Margin is supported by tying a cash account to a portfolio. You can update prices from a form, a file, or an online service. Updating a price will adjust the value of all portfolios holding that security. Capital Gainz provides several levels of detail and summary reports, and you can restrict the information by date range, security, or portfolio. Other reports include portfolio allocation, expected income, and Schedules B and D from the tax forms. You can generate price and moving average graphs, allocation charts, cost/value charts, and other graphs from your data. You can retrieve and update prices from the Internet. Unlike popular retail software that inappropriately forces the checkbook paradigm on users, Capital Gainz is designed solely to manage investments. Thus, investors find it to be more intuitive and 'cleaner' to use. Registration: $69 + shipping. You can also download an evaluation version at no cost. Requirements: Microsoft Windows 95/98/NT/2000/XP/Vista/7, 8 MB or more of RAM, 6 MB or more of hard disk space, mouse, VGA monitor. Download Capital Gainz 6.0 for Windows (appx 3 MB). All updates/fixes for Capital Gainz on Windows 7/8/10 have been packaged up in cgsupp.zip. This is a very large file, as it includes new Help file formats, Help files in PDF format, and the updated download library. After download, follow the directions in the README.TXT file in that archive. Bring up the directory you downloaded CGZ60.EXE to in Windows Explorer, and double-click on CGZ60.EXE to start the installation. We can accept Visa or Mastercard. Cost is $69 to register, $25 for updates. It is available as a download only, no disk/CD shipments. You can order via Paypal From Here. Simply reinstall the downloaded software using the values that will be provided. If you want to move Capital Gainz from one computer to another, click here for details on how best to accomplish this. If you just can't get the installation process to work, download CGZnn.ZIP and follow the directions in the README.FIRST file in that archive to manually install Capital Gainz. Capital Gainz is now a 32 bit program. Performance Report includes standard and IRR rate calculations. Graph colors and fonts can be set. Improved ZIP library for backup/restore. Options on Price Splits to affect just global security, just local security, or global and all linked local securities. Option on Price Rebuild to only trim prices down up to a specified date. Improved Price Update from File capabilities, with instructions on how to use popular Internet price sources. Additional subtotals on some reports. Separated backup and restore functions. New user and report settings. Can now sort security tables by name. On Tax Schedule Report, holding period is now determined using internal tables. Added user setting to not save window size on exit. Can no longer delete global securities with linked local securities. Can no longer delete brokers with linked global or local securities. Can no longer delete security types with linked global securities. Can now add Morningstar security types. Income Report breaks out non-taxable amounts. Fixed small discrepancy in percentages in Portfolio Detail and Portfolio Summary reports. Fixed small discrepancy in gain/loss in Portfolio Detail and Portfolio Summary reports in using Subtract Reinvested. Fixed problem where screen messed up if maximize Local Security Table then iconize/restore program. Gain/loss colors no longer used on highlighted items. Portfolio Detail, Portfolio Summary, and Short Position reports now shows shorts that were not covered by the specified end date. On Upgrade, orphan local securities linked to a Default global security. On Upgrade, local and global securities with blank brokers linked to Default broker. Numbers display correctly on Broker/Inv Co Report, with Subtotals, with ASCII Text option. Fixed Consistency Check - reported duplicate sales even if buy date did not match. Portfolio Lookup Table is now longer. Fixed bug in Consistency Check where all Price History sometimes not checked. Can now scroll left/right when viewing text files. On Backup/Restore, now shows error messages on invalid directories. Can click on Web address in About Capital Gainz to go to Web site. Fixed where if view text file, then print to a file in a different directory, the current directory got changed. The Assign Macros screen was shortened for screens with lower resolution. Added This/Last Quarter to Dates form. Added Repeat Activity Forms User Setting. Increased maximum per entry to 9,999,999 for shares and amount. Fixed small performance calculation error on bonds with premiums. In cost/value graph, no longer show real big numbers in scientific notation. Added Report Setting to hide total IRR. Accrued interest with no offsetting interest payment accounted for correctly in Performance Report. Numbered help topics, so if print all of the help files, they come out in correct order (instead of alphabetically, as before). Added accelerators: CtrlC=Calculator, CtrlK=Backup, CtrlA=Backup Auto. Now both pies always same size in Performance Graph. Fixed Show Graph Data format in Performance Graph so displays right. Update Prices from File now ignores comma delimiters in quoted strings. Import/Export now ignores comma delimiters in quotes strings. Performance Report fixed for Accrued Interest with no offsetting interest. Added Dates button on Graphics Menu. Improved date field entry - MM/DD/YYYY, MM/DD/YY (uses 2000 for 0-18, 1900 otherwise), MM/DD (uses current century). Fixed Update Prices from File so not treat first line as the format if it has ':' in it (AOL QIF). (12/25/98) Fixed problem where some buttons disappear when minimize/restore. (12/25/98) Fixed install problem where versions before 5.0 not recognized and automatically updated. Also cleans up old files correctly. README program group item now works if installed to directory whose name contains spaces. Date Range window adjusted so "to" is not partially hidden. Added Security Name line for Total Return report printed to ASCII Text File. Slight tweaks to IRR calculations. Fixed problem in Download/Import if installed to new directory. Runs Ok if installed on top of 5.2 installation. Fixed problem in Download/Import if use long filenames. Sped up performance report calculations for IRR. Can use Backspace key in calculator. Changed evaluation period to 90 days. Changed references to localweb.com to alleycatsw.com. Fixed problem where first portfolio skipped when upgrade from v3.1. Changed install so example data never overwrites existing files. Fixed so cash not sent to Cash Account if select Redistribute Sale Proceeds. Can now print graphic displayed in file viewer. Replaced About graphic with 16 color BMP. Lined up subtotals on Portfolio Detail Report. Fixed some isolated problems with program traps on Performance Report (IRR calculation). Added automatic price retrieval/viewing from the Internet. Fixed Last Price value on header of Activity Detail Reports, if sent to ASCII text file. Allocation report and graph now combine local security values if global security the same. Can now change Exchange/Exchange Symbol of Cash Type. Removed OLEAUT32.DLL, OLEPRO32.DLL, STDOLE2.TLB, COMDLG32.DLL, COMCTL32.DLL from installation. Fixed so Get Prices from Internet form points to correct Help topic. Made date field on Portfolio History Form longer. Added error if use Get Prices from Internet and no selected securities have symbols defined. Fixed problem where last couple of errors did not display (410, 501). Init Exchange Symbols now asks for confirmation, and displays updated table. Added Save and Restore Global/Exchange Symbol Mapping function to Global Security Table/Securities pulldown menu. Now tagging symbol sets Exchange Symbol in tag queue. Much faster rebuild of Local Security Table - speeds up operations such as changing Global Securities. Makes big difference if have a lot of Local Securities with 0 shares. Cancel on Get Prices from Internet now returns to form, rather than back to table. Fixed so Get Prices from Internet reads in volume. Added Get Historical Prices from Internet feature. Added email hotspot to About screen. Fixed Export function to account for larger numbers. Can now Copy to Clipboard from file/report viewer. Changed Exchange Symbols for indexes in example data to match Yahoo! symbols. Date/Time of last successful Internet price retrieval now shown on form's title bar. When execute Price Split, cursor stays at hourglass during all processing. Fixed bug in Print Graph to File where it did not work unless full pathname given. Added Print Setup button to Print Report form. Changed Graph printing, now uses internal form to set Landscape, etc., and values are saved. Short sales are now always short term on Tax Schedules, regardless of holding period, per IRS guidelines. Added confirmation boxes to Copy Local Security, Global Security, Portfolio. Added Combine Local Security function. Added Notes to Activity History Report. Added Tutorial to Help screen. System Config no longer uppercases directory names. Changed Copyright notices to 1999. Added separate report/graphics viewer options. Fixed so securities with ticker symbols longer than 6 characters display in tables and are updated. Fixed bug where Adjust Closed Shares on Price Split might not work. When record Accrued Interest, now is subtracted from Cash Account. When split shares, Adjust Closed Shares now checked by default. When output report to ASCII file, does not ask to overwrite anymore since user specifies file name in settings. Fixed file copy problem where copy failed if no file extension used. Allows up to 8 digits for volume. Allocation Report/Graph and Local Security Graph now will use margin/short values, based on new report setting. Fixed date entry problem in Price History Table. Now HTML format cleared on exit from Report Menu. No longer have to click on Ok twice on when change sell shares record. Fixed problem on reinvest for distribution/sale where list of securities sometimes appeared twice. Added grand total to Portfolio Detail Report for multiple portfolios. Added Net Buy figure to Performance Report. Capital Gainz will now exit automatically on system shutdown, if you set ExitOnShutdown to TRUE in CG.INI. Fixed problem with year 2000 dates in MetaStock and TC2000 data conversion (CGCV.EXE). If generate Tax Schedule for export, Subtotals report option is now ignored. Clicking on email address in About dialog box now inserts correct email address in email program. Added Hide Inactive option to Global Security Table. Fixed minimize/maximize problems with security table. Fixed so saves last sell method used. On Tax Report, margin now totalled by security in investment fees section. Add Not Taxed check box to Sell Shares Form. Allows you to calculate gain when you transfer shares that are not in a retirement account to a charity. Added user setting to end program on Windows shutdown. Fixed dialog box heading on select file if use separate report viewer. On Export Data, all items are now quoted. Disabled wash sales. IRS publications and interpretations are far too ambiguous to implement this in any given way. "Why does Capital Gainz report that no Help is available?" The online Help files are installed to the Documentation Directory. If you change this directory using the System Configuration item on the Config pulldown menu, the Help files must be moved as well. If you delete the Help files, you can reinstall Capital Gainz to add them back. "Why does Capital Gainz halt with 'Invalid Record Declaration'?" You are trying to execute Capital Gainz against data files created with a different version of Capital Gainz. You need to upgrade your data files by running the Capital Gainz Upgrade program. "How do I get help with hard to explain problems?" For complicated problems, the best way to get help is to send us copies of your data files, *.DAT and *.K01, on a diskette. Be sure to include a detailed explanatory note, including a problem description, list of events leading up to the problem, and information about your system configuration. "Which files are the user data files?" User data files are those matched by the *.DAT and *.K01 wildcard templates. "Why doesn't data that I enter show up on the tables?" Two possibilities. First, if you are entering data from a table, then the system date range may be set and your entries are outside of the range. They are written, but don't show up in the tables until you reset the date range. Second, it's possible that the file indexes are corrupted - run Maint, Rebuild/Pack to rebuild them. "Why does my Capital Gainz window grow (or shrink) between executions?" This can happen if you exit Capital Gainz and there is a horizontal or vertical scrollbar on the application frame, or there may be a discrepancy with the video driver. Capital Gainz saves the window sizes on program exit for use the next time you run it. You can block this behavior, eliminating growing/shrinking windows, by turning off the Save Windows Sizes at Program Exit option, available from Config, User Settings, Windows. "Is Capital Gainz Year 2000 ready?" Yes. For date entry, you can specify MM/DD (uses current year), MM/DD/YY (uses 1900 for 0-18, 2000 otherwise), or MM/DD/YYYY. However, reports only show MM/DD/YY. "Can I secure my data from others who use my computer?" Use the Set Password menu item on the Config pulldown menu to password protect access to the program. If you set the password to all blanks, Capital Gainz does not prompt for a password at startup. "I forgot my password. What do I do?" To regain access to Capital Gainz, you must reinstall the program, which will set a blank password. "Do I have to enter all of my prior activity to get started?" In order to match purchases with future sales, determine long or short term holding periods, and accurately calculate performance return, all prior activity must be recorded. This task is made easier by the repeated entry of the activity forms. There are two short cuts available. First, if you've been buying and selling shares of a mutual fund over some time period, you only really need to record purchases that are still owned. Another alternative is to lump all of your holdings into two groups, long and short term. Record one big purchase for the total shares and basis of the long term group on a date older than the long term holding period. Then, record the individual short term purchases. This approach works great with money market funds, which maintain a constant price. "How do I change or delete a buy, sell, or distribution entry?" To change or delete activity, use the Buy Shares Table, Sell Shares Table, or Distribution Table item on the Activity pulldown menu item on the Local Security Table. Then highlight the item in the list and use the Change or Delete button. "How do I record mutual fund loads?" Loads are recorded similarly to commissions, but they are calculated differently. A $35 commission on a $1000 purchase means you paid $1035, invested $1000 of it, and paid $35 to the broker. A $35 load on a $1000 purchase, which is a 3.5% load, means that you paid $1000, invested $965 of it, and paid $35 to the mutual fund. The Load button on the activity forms brings up a calculator that separates the load from the purchase amount and calculates the unloaded price. "How can I record a purchase for $0.00?" Capital Gainz usually requires non-zero values for shares, price, and amount. If you want to set one or more of these to zero, turn off automatic calculations in the User Settings or on the activity form. "Why is the per share value displayed on the Distribution Form so low?" You are misinterpreting the meaning of the per share field. It's the amount of the distribution divided by the number of shares owned, not the price. "How do I find the per share amount of a distribution?" For stocks and bonds, this is the stated dividend/interest rate. For mutual funds, check your statements immediately after receiving a distribution, as they usually include a per share value. If not, the value calculated and displayed by Capital Gainz is usually close enough for accurate yield and total return figures. "I've been using the per share value wrong. How do I fix it?" There's a button on the Distribution Table, Recalculate Per Share, that will recalculate the per share values for the displayed distribution records. "Does the order that I enter activity matter?" The 2/2/91 sale should close 10 shares at an average price of $11.50, and the 4/1/91 sale should close 10 shares at an average price of $12.25. If you entered the 4/1/91 sale before the 2/2/91 sale, the 2/2/91 sale would use the correct $11.50 basis, but the 4/1/91 sale would incorrectly use a $12 basis. The cost used is the average cost at the time the sales are recorded. "My 401K does not provide the share price. How can I track it?" The best way to handle this type of investment is to initially use a fixed price of $100.00, and set the selling method to the average cost method so shares you withdraw will have the same basis. When you receive a statement showing your gain/loss, record the price using the Prc Val button to calculate the price from the known value. Use the last calculated price for subsequent purchases. "Can I use one global security for both my wife's and my 401K?" No. Since the Price From Value feature derives a price from the value of the security, the prices will differ unless identical contributions are made. Use a unique global security for each 401K local security. "Can I enter multiple activity on a single date for a security?" Yes. You can have multiple purchases, multiple sales, and/or multiple distributions on a given date for a single security. When a distribution is recorded, the per share amount is calculated based on the number of shares held as of the beginning of the specified date. This allows for accurate Per share calculations when a mutual fund pays dividends and capital gains on the same day. However, when selling shares, the number of shares available to be sold are the number as of the end of the specified date. Thus, you should not record multiple sales on the same date if you are using the average cost selling method. "Is it OK to delete old distributions and sold shares?" You really shouldn't delete the old records, as they are used to determine your overall performance return with the security. If you use the average selling method, you can't delete the sell shares records, since they are required to calculate the current average price. If you end up selling all shares of a security and want to clean up, I suggest defining an 'inactive' portfolio, and moving the security to it. "How do I record an IRA maintenance fee?" To record an IRA fee, use the Record Fee item from the Activity pulldown menu on the Local Security Table, or record a distribution using the FEE type. If you paid the fee with a separate check, then that's all you need to do. If you let the fund company sell shares to realize the fee, you'll need to record the sale, so answer Yes when asked if you want to sell shares to cover the fee. You'll then fill out the Sell Shares Form for the sale. "How can I see a chronological list of all activity?" The Activity History Report shows a chronological listing of purchases, sales, and distributions for a security. "Why do the values calculated on entry differ from my statements?" There are occasionally rounding differences, but you probably need to adjust the precision settings for the local security. "How do I record a stock that was taken over by another company?" Use the Convert Security item from the Security pulldown menu on the Local Security Table. Be sure to examine the help examples, since this can be a complex operation. Also, study the documentation you receive from the company in order to understand share conversions and ratios. "What selling methods am I allowed to use?" According to the IRS publications, anytime you have multiple purchases of a security, you are assumed to use the first-in/first-out method unless you provide explicit prior written identification of the shares you want to sell to the agent responsible. For mutual funds, you can also use the average cost selling method without notifying the agent. However, once you use the average method, you must continue to use it as long as you hold shares of that fund. I suggest not using the average cost method unless you absolutely have to, since it requires more care and will never be the optimal method for tax planning. "Why don't reinvested shares show up in the Buy Shares Table?" After recording a distribution and answering Yes to the reinvestment question, you still must complete the Buy Shares Form that comes up. Usually, all the information is filled in correctly except for the price. "How do I record a stock dividend?" A non-taxable stock dividend of non-identical shares is more complicated, and you should consult the IRS publications for details. "How do I sweep sale proceeds into a money market fund?" You can use the Set Cash Account item on the Securities pulldown menu on the Local Security Table to set up the cash account for the portfolio. Or, you can set the redistribute proceeds option in the User Settings, so you'll be asked where you want to invest the proceeds after recording a sale. "Why don't security totals in the Local Security Table match Buy Shares Table totals?" The local security record maintains totals for current shares, amount, and commission. If you abnormally terminate the program during an operation that manipulates activity records, the local security's values may become out-of-sync with the actual activity totals. This can be fixed manually from the Local Security Table using the Fixup item on the Security pulldown menu, or you can use Consistency Check item on the Maintenance pulldown menu to fix up such discrepancies. "How do I handle zero-coupon mutual funds?" Zero-coupon mutual funds pay distributions, so they differ from the implied interest of zero-coupon bonds. After a distribution, the funds use a reverse split to adjust the shares so you have the same number as before the reinvestment (if you reinvest). You need to record the distribution and reinvestment, then execute a split in the indicated ratio. "How do I handle Savings Bonds?" Lump all savings bonds of the same series into multiple securities with different denominations. Make sure the savings bond security type specifies to report sales on Schedule B. The gain on sales is then treated as interest. Record a purchase using the cost. Thus, a $50 bond purchased for $25 would be recorded as a purchase of 1 share at $25. When you redeem savings bonds, use the specific identity selling method so you can pick individual bonds. To sell a $50 bond purchased at $25, record a sale of 1 share at $50. "Can I show both long and short positions for a security that I am hedging (long and short holdings) instead of seeing the combined figures on the Local Security Table?" Yes. Simply define two local securities linked to the same global security, and use one for the long position and one for the short position. By linking them both to the same global security, the current positions will be updated by setting the price of that global security. "Why aren't short sales covered when I record a purchase of a security that I am short?" You must explicity use the Cover Short Sale function to conver short sales, since you can be long and short a security at one time. "I have a security that spun off another company - how do I record this?" "When I transferred shares to another portfolio, only the buy shares were transferred, not the sell shares or distributions." The Transfer Shares function transfers buy shares only - such as when you transfer holdings to a child's account or to charity. To move all activity for a local security, use Copy Security, then delete the original local security. "How do I handle a security that was converted into a new company?" You could use the Convert Security item from the Security pulldown menu on the Local Security Table. Or, it may be easier to just change the security symbol and name, and execute a Price Split if the share price or count was changed. "What should I do with securities that have been closed out?" You can delete the security, which will remove it along with all associated activity. Deleting a local security does not delete the associated global security and price history - if you want to remove these, you'll need to delete the global security as well. A better approach is to set up a separate inactive portfolio, copy the security that was sold off to it, then delete the security from the original portfolio. "Is there a way to not show securities with 0 shares?" Turn on the option in the User Settings, or on the Local Security Table, to hide inactive securities. "Why do I get a 'Duplicate Key' error when defining a local security?" A local security already exists with the specified symbol. If it does not appear on the Local Security Table, turn off the Hide Inactive option checkbox on the toolbar. "I defined a Local Security earlier - why doesn't it show up in the local security table now?" It probably doesn't have any open shares, and you have the Hide Inactive option set. Turn off the Hide Inactive checkbox on the toolbar. "How do I manage margin accounts?" Define a cash security for the portfolio, and use the Set Cash Account option on the Securities pulldown menu on the Local Security Table to define the security as the cash account for that portfolio. Then, whenever you buy shares, the amount is subtracted from the cash account, and whenever you sell shares or receive a distribution, the amount is added to the cash account. "I gave my kids shares that I held - how do I record this in Capital Gainz"
You can handle a non-taxable transfer two ways. First, if you transferred all buy shares to one account, and had no sell shares or distributions, simply use Security/Copy Security from the Local Security Table to copy the security to the destination portfolio, then delete the original security. However, to transfer some number of buy shares to another portfolio, first define the security in the destination portfolio (if necessary), then use Activity/Transfer Shares from the Local Security Table. You'll specify the destination portfolio and security, then the number of shares to transfer and the selling method to use in selecting shares. "I have a money market account I've been using for awhile, and want to treat it as a CASH asset type now." Use the Convert to Cash Asset function to convert it to a CASH asset type. "Why do I have to define global and local securities?" Global securities define a stock or fund and maintain price histories, while local securities maintain activity for a specific holding. Several local securities can be linked to one global security, centralizing price data. "When I try to delete a global security, I get an error that there are local securities linked to it. How can I figure out which ones they are?" Use the Global Security Report, and be sure the Report Setting option for showing subtotals is set. "How do I record a split of .98765 for 1, since the precision exceeds the entry field?" Simply record the split as 9.8765 for 10, which is identical. "Why don't updated prices show up on the tables and reports?" Capital Gainz always uses the latest dated prices. If you inadvertently add a price for 12/31/94 instead of 12/31/93, then update prices on 6/1/94, tables and reports will still use the 12/31/94 date since it's later. Other prices are still added, but you need to delete the 12/31/94 entry from the Price History Table. "How can I resynchronize price history with my activity?" Use the Rebuild Price History choice from the Prices pulldown menu. "How can I trim the size of my price history?" Use the Rebuild Price History choice from the Prices pulldown menu to keep only one price per week or month. "Can I change the security sequence while updating prices from the screen?" If you set the exchange field in the global securities, then Capital Gainz displays prices for updating in order first by exchange, then by global security symbol. This makes it easier to update prices using listings from the newspaper, as you don't have to keep flipping back and forth between sections. "I messed up importing a price file - how can I fix the prices?" 1) Use the Example button on the Update Price From File form to generate a price update file, showing the latest prices and dates. 2) Save the displayed prices to a file. 3) Edit the file with a text editor, correcting the prices. 4) Use Prices/Update Prices from File again, reading in the altered price file. "Can I read in prices from the Internet?" In Prices, Update Prices from File, you specify a file of prices retrieved from an online source. See the help topic on this subject for a list of Internet price sources and directions on how to use them. "Why does the gain/loss figure include reinvested shares?" The Local Security Table shows the current unrealized gain or loss of all outstanding open shares, including those purchased with reinvested distributions. If you turn on the User Setting option to subtract reinvested distributions, the Local Security Table and Portfolio Detail Report will subtract reinvested distributions from cost in determining gain/loss. "Why is the yield so high (or all '*'s)?" You either entered the amount of the dividend for the dividends/year field in the Global Security Form, or entered a price for the per share field in the Distribution Form. The dividends/year figure should indicate the number of times a year the company pays dividends, such as 4 for quarterly payouts. The per share value should indicate the per share amount of the distribution, not the reinvestment price, and is normally listed on your statements. "Why are total return percentages correct, but the rates so low?" There is probably an incorrect, 'stray' entry in the Price History Table. If you mistakenly added a price for 1/01/41 instead of 1/01/91, then calculating total return percentages for all dates would skew the rate by 50 extra years. To fix this, check the Price History Table. "What's the difference between total return and performance return?" Total return uses only the price history of a security to show the return, simulating a buy-and-hold strategy with reinvested distributions. Performance return is calculated based on your actual recorded purchases, sales, and distributions. "What do the variations between total return and performance return mean?" If your actual performance return was under par, but the total return is good, then you've adversely affected your performance return through bad timing. The security is a good-performer, and should probably be held. This effect is seen mainly with a dollar-cost averaging strategy employed over a short period in a rising market. If your performance return was good, but the total return is under par, then you've managed to increase returns through good market-timing. While a buy-and-hold strategy would not have done well, the market-timing effects of your purchases and sales made this security a winner. This effect is seen mainly with a dollar-cost averaging strategy employed over a long period in a fluctuating market. "What is the 'rate' figure?" The yearly rate of return, assuming annual compounding. "Can I just see a straight, non-adjusted performance return figure?" Turn off the User Settings option to use the internal rate of return. "How are purchases on different dates factored into performance return?" The internal rate of return calculation takes time-weighting of cash flows into consideration. "Why does the yield calculation only use the last dividend?" Yield is a measure of expected return, so Capital Gainz takes the last dividend/interest distribution per share and multiplies it by the number of expected payouts. "Why is the gain on a shorted security so high in the Local Security Table?" Remember that the Local Security Table shows unrealized gain/loss. Since you shorted the security, it didn't cost you anything, so any gain (or loss) will be, essentially, infinite. "Why not show Cost and Value in Portfolio History?" If no money ever leaves a portfolio, then Cost can be calculated and shown. However, if any money ever leaves a portfolio - as is far more common - then allocating cost across multiple transactions is not feasible. If no money ever leaves a portfolio, then the difference between Value and Return in Portfolio History is Cost. If money does leave the portfolio, then this is no longer true. In fact, it's possible to have Return exceed Value. "Why does the Performance Report show 999999% for a shorted security?" In the above, reinvest will be greater than or equal to buy_amt if there is a gain, so the basis for the division is 0. While a more reasonable percentage could be calculated by swapping the buy/sell dates for a short sale, that would result in incorrect overall portfolio percentages. The performance really is infinite - you put $0 down and received something at the end. Since no broker allows you to short shares with no money on deposit, the overall portfolio performance will be correct. "How are long and short term capital gains distributions treated?" By default, Capital Gainz treats short term capital gains distributions as ordinary dividends, and long term capital gains distributions as transfers to Schedule D. However, you can modify the security types to change this behavior. "When is long or short term status determined?" Capital Gainz used to deterimine this at the time the sale was recorded, but now determines it when the Tax Schedule Report is generated, using internal tables for each year. "Why doesn't a local security with distributions and sales show up on the tax reports?" The local security is probably defined as tax-exempt, which means it's treated like an IRA. You can change the security from the Local Security Table. "What does 'Group Sales' mean on the tax reports?" The group sales option lets you group all purchases for a given sale, resulting in a single short term transaction and a single long term transaction. If you've been buying shares of a mutual fund monthly and then close the fund by selling all of the shares, grouping sales makes the Schedule D report much shorter and easier to transfer to your actual tax forms. The purchase date shown for grouped sales is VARIOUS. "Should I show sales of money market funds on Schedule D?" "How do I make a security's dividends tax-free on Schedule B?" To define a security as distributing tax-free dividends, select a tax-free security type for the associated global security. Predefined tax-free security types have the phrase 'tax-free' in their names. You can also change the tax-free status of a security type, or define a new one that is tax-free. "How do I record a foreign tax reported on a year-end 1099 form?" Record the amount of the Foreign Tax as a Dividend on the last day of the year, without reinvesting the distribution. Record the Foreign Tax as a Fee on the last day of the year, without selling shares to cover the fee. "How do I handle Savings Bonds for taxes?" Savings Bonds are like zero-coupon bonds, except taxes on the increase to basis can be deferred until they are redeemed. You can set the Savings Bond's security type so that sales are reported on Schedule B. "Why doesn't the distribution total on my tax report match the amount on my 1099?" There could be several explanations. A mutual fund may have paid a foreign tax, a dividend reinvestment plan may have transparently absorbed brokerage fees, you may have omitted discounts on dividend reinvestment plans, or you may have made a data entry error. Compare the Activity History Report against the end of the year statement mailed to you. "How do I export tax data to TurboTax (or TaxCut)?" To generate an import file for tax preparation programs, select the Tax Schedule Report, then choose the option to export the data in tax exchange format (TXF). After the TXF file is created, exit from Capital Gainz. Start up your tax preparation program, specify the directory and file for the import TXF source, and then execute the import. "Why does my tax software return errors when reading the TXF file?" Make sure that you generated the Tax Schedules Report in Tax Exchange Format, that you specified the correct file name and directory to your tax preparation program, and that you indicated to import a TXF file. Unfortunately, the Tax Exchange Format (TXF) is always evolving, and tax software may interpret TXF files differently, or not recognize newly implemented features. "How do I handle purchase discounts for reinvested dividends in my DRP?" Some DRPs give you a discount on reinvested dividends. The discounts should be reported as income in the year you receive the shares, and the difference added to the cost basis of the shares. In Capital Gainz, use a negative commission for the purchase discount. "Strange things are happening, like incorrect prices showing for securities. What's can I do?" Try running Rebuild/Pack Files from the Maint pulldown menu. This will rebuild any corrupted indexes. "How can I tell if I have inconsistent data?" Run the Consistency Check procedure, using the Consistency Check item from the Maintenance pulldown menu. The most important problems indicate that security values don't match activity tables, probably because of abnormal terminations. Serious errors, such as out-of-sync index and data files, can cause many messages during the consistency check. These types of problems are best detected by 'strange' program behavior, such as entries not showing up in tables or activity listings out of date order. "How can I fix inconsistent data?" You can manually address messages printed by the Consistency Check output log. Or, you can tell the Consistency Check procedure automatically fix a number of well-defined problems. "Why are some letters 'chopped off', or truncated, in the displayed report?" You printer resolution is greater than the display resolution. The printed output will look fine. "Why is the displayed report unreadable?" Some printer drivers cause unintelligible displays for reports. The printed output should be fine. "Why do reports print so slow on my dot matrix printer?" Capital Gainz reports use a limited number of different fonts and sizes. Dot matrix printers differ in capabilities, so rendering the correct output may significantly affect the output speed. A laserjet or inkjet printer is strongly recommended. "Reports will not print - I get an error from Windows (or the printer)." This is likely caused by a bad printer driver. Capital Gainz uses the printer driver to render the report. If you can't solve the printer problem, use the ASCII File Output option in Capital Gainz Report Settings. "Can I save reports to disk, for later retrieval and searching?" Use the ASCII File Output option in Capital Gainz Report Settings. This will send report data to plain text file. "How do I avoid having the large total in my money market account obscure the other bars in the Cost/Value Graph?" Capital Gainz automatically scales data based on the largest value, so the large money market holding is adversely affecting other securities. To skip money market funds, choose not to include cash equivalent securities in the Graphics Settings. "Can I get rid of all these lines cluttering up the Price Graph?" The average line is displayed by default, but can be turned off in the Graphics Settings. You can also turn off options for drawing a grid and for displaying the volume graph. "Can I generate graphics files to use with other programs?" You can choose the File button while viewing a graph, then output the graph to a bitmap (BMP) or Windows metafile (WMF) file. "Why is the Cost/Value graph so hard to read?" Your printer resolution is greater than the display resolution. The printed output will look great. If you prefer to just view graphs, I suggest that you not specify 3-D graph types in the Graphics Settings. "I have a black and white laser printer - how can I print out pie charts to distinguish slices that are in color on the screen?" In the Graphics Settings, specify a fill type of pattern, or pattern and color. By default, only color is used for the fill type. "Can I generate price graphs on a logarithmic scale?" Set the logarithmic axis option in the Graphics Settings. "The allocation chart by security is hard to read because there are too many pie slices - can I reduce how many are shown?" You can set the maximum number of pie slices in Graphics Settings. Any extra slices will be combined into one extra 'Other' slice. "I only look at price graphs for a few of my securities, but have to scroll through the ones I don't care about to reach those that I want to see. Is there a better way?" On the Graphics Menu, use the Global Sec button to tag securities that you want to graph. If you want to save the list for future sessions, use the Save button to save the list, and the Recall button to recall the list. In Windows Explorer, open the Capital Gainz program directory (by default, c:\capgnz). Find capgnz.exe (you may have to change Windows Explorer setting to see file extensions). Right click on capgnz.exe, and choose Properties from the context menu. Choose Compatibility tab, then select Windows XP as the compatibility mode to run in. Click Ok, and graphics should now work. If Capital Gainz is open, close it. Click here to retrieve updated Capgnz internet access DLL. When asked, choose Save As (not Open With) and save this file to your Capital Gainz program directory, probably \capgnz. Be sure you put it in the right directory, and that it overwrites the current cginet.dll file (doesn't just create a "copy of..." file name"). If you are not asked if you want to overwrite the existing cginet.dll, then you are saving it to the wrong directory. Retrieval should work now. You can always use View before Ok after the download, to make sure prices aren't messed up. Unfortunately, Yahoo! also changed their procedure for retrieving historical quotes. There is no available fix for this. However, there is a workaround. If you can get prices in a comma-separated file, in Windows/DOS file format (may rule out Yahoo! ), you can use Capital Gainz' Prices/Update Prices from File feature to import the prices. In Windows Explorer, bring up the directory with the Capital Gainz data files. Capital Gainz does not include inherent support for options. Investors who think options are easy to deal with have obviously not looked very hard at issues concerning taxes, holding periods, etc. I've been looking into option support for awhile, but there are no definite plans yet. for Microsoft 10/97 140 calls. To be honest, I'm not totally clear on tax implications. I believe that if you sell a covered call, you 'restart' the holding period on the underlying stock. Also, I am not even going to try to address exotic strategies such as straddles. If there are any experienced option players out there, I'd much appreciate you checking my logic. If you are confused by the terms and descriptions on this page, then you should probably not be trading options. This is as simple as it gets. Define a global security, perhaps including the expiration data and strike price in the name, such as ABC 0100 50. Define a local security linked to the global security. Record a purchase of 200 shares of ABCXY at $7.50, with a commission of $25. Record the sale of 200 shares of ABCXY at $9.50, with a commission of $20. Record a short sale of 200 shares of ABCXY at $7.50, with a commission of $25. Record the short sale cover of 200 shares of ABCXY at $9.50, with a commission of $20. Note: If the call was covered, this may affect the holding period of the stock if you were to sell it. This would require you to change the purchase date. Record the short sale cover of 200 shares of ABCXY at $0.00. Clear the AutoCalc checkbox to allow entry of 0 values. Delete the short sale of 200 shares of ABCXY. Record the sale of ABC at the strike price, $50. Add the option premium recieved to the amount. Clear Save Window Size Settings on Program Exit option. Edit the CG.INI file with Notepad. This will prevent the window size from being changed between program executions. "Could not create graph (VtChartLib.VtChart)"
it usually means you have not registered the graphics library. This happens automatically at program installation, but could result if you move all your files to a new computer or directory. To fix this, just reinstall Capital Gainz. Find COMCTL32.DLL using Windows Explorer. It is probably at C:\WINDOWS\SYSTEM32\COMCTL32.DLL. If you can not find it, use Tools, Find in Windows Explorer to search your hard disk. Follow the directions to install COMCTL32.DLL. Reinstall Capital Gainz - during installation, it registers the graphics DLL, which requires the newer COMCTL32.DLL. Go to the Portfolio Table: File/Portfolios. Use Portfolios/Copy Portfolio to copy the highlighted portfolio. The Portfolio Id selected will be the first unused number. In Windows, create a new directory to contain the portfolio files. In these directions, C:\TMP_PORT will be used. Go to the Portfolio Table : File/Portfolios. Highlight the portfolio that you want to copy, and select Portfolios/Copy Portfolio. Set the To Directory to C:\TMP_PORT. Note: The Copy can take a long time, especially if there is a large price history file. All Global data as well as the selected portfolio's data is copied. Copy the *.DAT and *.K01 files from C:\.TMP_PORT to a diskette. In Windows, create a directory to contain the portfolio files. In these directions, C:\TMP_PORT will be used. In Windows, copy the files from the diskette you made to to the C:\TMP_PORT directory. Use Config/System Config, and change the Data Directory to C:\TMP_PORT. In these directions, the original data directory will be assumed to be C:\CAPGNZ. When the Ok button is clicked on Capital Gainz will restart, using data from the directory containing the new portfolio files. Set the To Directory to C:\CAPGNZ. Note: The Copy can take a long time, especially if there is a large price history file. Any new global data from the portfolio data files will be added, but existing Global data will not be affected. Thus, global securities may be added, but existing ones will not be changed. Use Config/System Config, and change the Data Directory back to C:\CAPGNZ. When the Ok button is clicked on Capital Gainz will restart, using the original data directory. Copy the data files corresponding to the portfolio you want to a diskette. For example,if you want to copy Portfolio #3, copy files *003.DAT and *003.K01. Start up Capital Gainz, and create the portfolio in the Portfolio table using File/Portfolios, then Portfolios/Add Portfolio. Exit from Capital Gainz, and copy the files from the diskette to the Capital Gainz data directory. The portfolio number must be the same on both the source and destination machines. In the prior example using Portfolio/Copy Portfolio, the number could differ on the two machines. Any global data, such as global securities, security types, price history, etc. created for the portfolio on the source computer will not be copied. Thus, this method should only be used if all global securities and security types in the portfolio being copied already exist on the destination computer. You can add prices from the new portfolio's activity data to the source computer using Prices/Rebuild Price History, and rebuild prices from Activity. On the old computer, copy Capital Gainz data files to diskette using Capital Gainz Maintenance/Backup function. If all of the files will not fit on one diskette, specify the ZIP compression option. On the new computer, install Capital Gainz. On the new computer, copy the Capital Gainz data files from diskette using Capital Gainz Maintenance/Restore function. If ZIP compress was used in the Backup, specify the ZIP compression option. Click on the icon for the C drive in the left pane. From the menu, choose File, New, Folder. This will add a generically named folder. Right click on the new folder's icon in the right pane, and choose Rename. Type CAPGNZ and press the Enter key. See what directory Capital Gainz data is stored in on the old computer. If you don't know, run Capital Gainz and use Config/System, and note the Data Directory setting. For this example, we'll assume C:\CAPGNZ. Insert a blank diskette in the A: drive of the old computer. Start up a Command Prompt session - if there is not an icon on the desktop for this, look for Command Prompt and the MSDOS icon under the Start Menu, Programs. Insert the diskette in the A: drive of the new computer. Install Capital Gainz on the new computer, specifying the same directory where you copied the data files to, such as C:\CAPGNZ. Use Start, Programs and find the Capital Gainz program group. In that group, find "CG Upgrade" and click on it. The Capital Gainz upgrade program starts up. It should detect the current version of the data you have installed, but be sure to verify it. If you are not sure what version of Capital Gainz was used to create the data, go back to the old computer, run Capital Gainz, and choose Config/System. Click on Ok. When prompted, be sure to do the quick backup suggested, then Continue to upgrade the data. If you want to maintain Capital Gainz on both the old and the new computers, swapping data files back and forth to stay in sync, be sure that the same version of Capital Gainz is running on both computers. Capital Gainz Newsletter #10 (Apr 2000): Recent Bug Fixes, Update Prices Problem, Saving Reports, Capital Gainz on Macs, Data Upgrades, Tax Treatment by Year, Graphics and Registry, Report Types, Discounts on Purchases, Linux. Capital Gainz Newsletter #9 (Jan 2000): Minor Upgrades, New 'Net Buy' Figure, Taxes and Selling Methods, Email Recommendations, Electronic Brokers, Tax Report - Schedule B, Tab Key, New Company?, Y2K, Search Engines. Capital Gainz Newsletter #8 (Oct 1999): New Combine Securities, Sending Screen Shots, Report File Format, Multiple Reports/Graphs, Email For Life, File Associations, Moving to a New PC, Selling Methods, SpamKiller, Price Retrieval Problem. Capital Gainz Newsletter #7 (Jul 1999): Price Updates from the Internet, Historical Prices from the Internet, Privacy Statement, Easier Download Format, Sending Screenshots, Data Directory, Security Types, Portfolio Allocation, Grouped Sales in Tax Reports, Total Return vs Performance. Capital Gainz Newsletter #6 (Apr 1999): Securities Sold Off, Using InfoBeat, Moving to Another PC, Trimming Prices, Price File Format, Upgrading Data, Version 6.0 Problems, Printer Drivers, Virus Alerts, Microsoft Y2K Announcement, $20 Million Beat the Street Contest. Capital Gainz Newsletter #5 (Jan 1999): Version 6.0 Released, Version 6.0 Cash Accounts, Report Options, Year 2000...Again, Update on Price Updates, Technical Support, Printing Help Files in Version 6.0, Tax Tip: Trading Up Basis, Online Brokers: Fund Centers, Symantec Ghost. Capital Gainz Newsletter #4 (Oct 1998): Version 6.0 Schedule, Customizing Security Table, 1998 Tax Holding Periods, Cash Types in v6.0, Recording Options, Mergers and Spinoffs, Price Sources...Again, Advertising, Interested in Web Development?. Capital Gainz Newsletter #3 (Jun 1998): Global vs Local Securities, Security Symbols, Year 2000, Decimal Precision, Portfolio History, Adding Shortcut, Version 6.0 Features, 32 Bit Windows, Good Guys/Bad Guys, Image Tips. Capital Gainz Newsletter #2 (Apr 1998): Window Shrinking/Growing, Sell Methods, Never Panic On Errors, Bonus News, New Browser, MS IE and Capital Gainz Installation, Price Sources, Reinvestment/Redistribution, Portfolio History, Performance. Capital Gainz Newsletter #1 (Jan 1998): Web Site Improvements, Changes for New Tax Laws, Quick Portfolio Switch, Fixing Up Securities, Rebuild/Pack Data, Backing Up Data, Get Rid of Version 5.0, Import Prices, Manuals, Report Data Chopped Off, Plans for Version 6.0, Call For Beta Testers. Capital Gainz Bonus News #1 (Jan 1998): Additional Settings for Updating Prices, Allocation Breakdown by Security Type, LaserList Utility for Printing 2-Up, Apologize for Email List, Bargain Sites for Hardware/Software, What is Distribution Per Share?, Entering 0 Amounts, Recording Options, Dave Asks. For support, contact: Dave Cohen at AlleyCat Software. Be sure to include your name, registration number, and current version. If you are a software manufacturer interested in adding Capital Gainz to your arsenal, we would like to hear from you!